This is the Pineapple News main window. Note that there are four news accounts configured, three of them “folded up” at the moment. The numbers in parentheses are the total unread messages for each newsgroup and account. The button on the right side of the header bar with the JPEG icon indicates that the message being viewed contains a binary attachment. 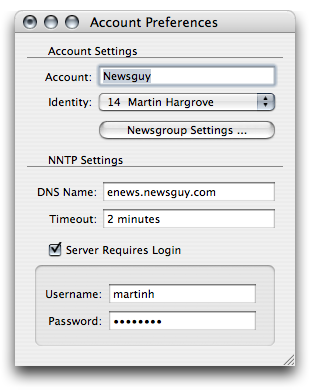 This is where you enter information about your news server. 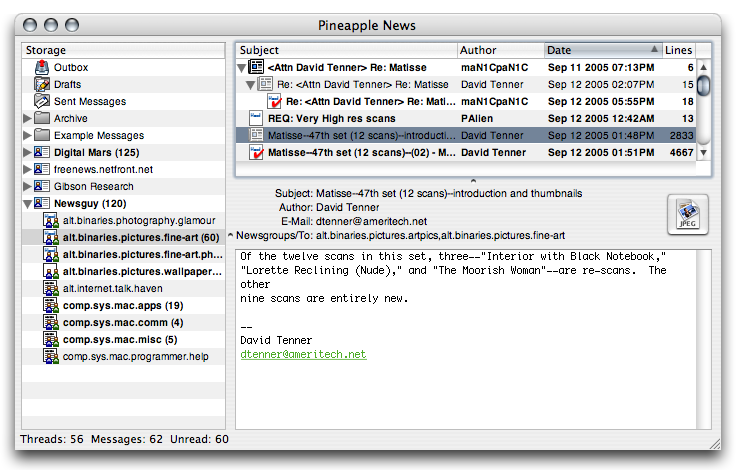 Pineapple News is a USENET newsreader for Mac OS X. It is primarily an offline reader, but it has features and user interface conventions that make it easy to use online also. As you can see, it uses the traditional three-pane paradigm. Way back in 1999, I started working on the BeOS version of this program, which I unleashed on an unsuspecting public in 2000. The Mac OS X version was released five years later, in 2005. They share almost no code, because the BeOS and Mac OS X Cocoa APIs are quite different. The two programs are otherwise similar, though. The program is easy to set up and use. Steven Ansell, the guy who drew all the program’s graphics, had never heard of USENET before. He was able to get up and running with Pineapple News after asking me only one question, which I answered in just a few sentences. And that was before I had finished the manual. You will need a PowerPC or Intel Macintosh running Mac OS X 10.3.9 or later. The amount of disk space consumed will depend on your viewing habits, but 80 megabytes sounds about right. You need a connection to the internet. Any type will do: analog modem, wireless, cable, DSL, T1. 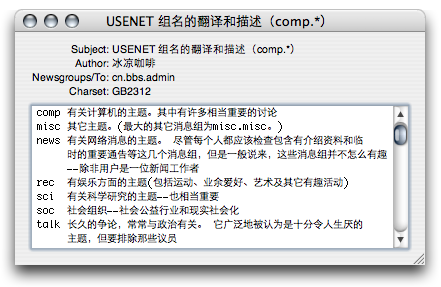 Finally, you’ll need an account on a USENET server. Typically you would purchase one from providers such as Newsguy or news.individual.net, but there are servers available on the internet that you can use for free. The program’s documentation explains how you go about finding and using such servers. 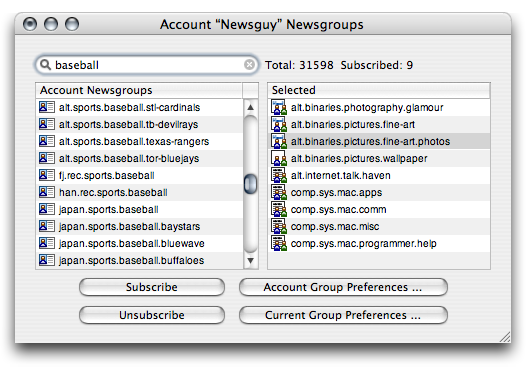 You can search for groups you’re interested in, and choose the ones you want to subscribe to. It’s easy to set up multiple server accounts and use them all simultaneously. You can create many identities, each with its own signature file, and switch between them quickly. You can set individual groups for headers-only or full article downloads, which helps you make the best use of your network bandwidth. The program allows you to create your own storage folders, which you can use to save copies of messages that interest you. Cross-post detection means you won’t have to read the same article more than once. The program has a killfile, so you can ignore unruly posters. You can proof messages you write with Mac OS X’s built-in spell-checker. Extensive online help is available in standard Mac OS X helpbook format, which allows you to quickly search for keywords of interest. The program displays quoted text in distinctive colors, so it’s easy to see who said what. If you don’t like the default colors, you can customize them from the program’s preferences window. It searches message text for URLs and e-mail addresses and turns them into highlighted clickable links, so that USENET messages can have some of the advantages of web pages. Pineapple News can decode binary attachments in several formats: yenc, uuencode, MIME base64, and MIME inline. If an attachment is spread across two or more message files, it will automatically search through all downloaded messages in the current newsgroup, find the necessary parts, and stitch them back together. Currently, the program can’t deal with RARs, PARs, or NZB files, but I’ll likely add support for them, if there is enough interest. Here the program is displaying a message in Chinese. Perhaps Pineapple News’ strongest feature is its foreign language support. It knows how to interpret any kind of messages you might encounter, and can properly display them, regardless of what language they were written in. It knows all about MIME, quoted-printable, base64, and character sets. If you run across an HTML message, the program will use a WebKit view to display it for you. The message viewer allows you to specify a custom font, so you can choose one that’s well-suited to your native language. Mac OS X’s superior font-handling abilities are a big help here: if the current font doesn’t contain the glyphs needed to display a particular bit of text, it will search all your installed fonts until it finds one that does. The practical upshot is that improperly-decoded message text is rare. I don’t know about you, but personally I often avoid downloading and installing new programs because I’m afraid they will make a big mess, and that I’ll have trouble getting rid of them. Pineapple News does not have an installer. You download the archive, the program pops out, you move it to your Applications folder or wherever you would like it to go, and you’re done. The program stores its message data in only one folder. If you decide that Pineapple News is not for you, you can toss the program, its data folder, and its prefs file into the trash, and it will be completely gone. 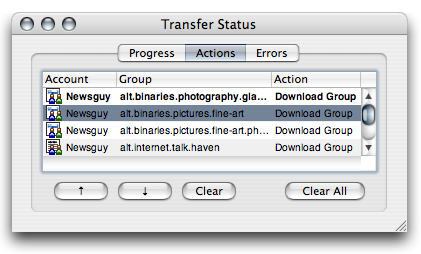 This window shows the queue of network transfers. The one at the top in bold is currently executing. The buttons below allow you to reorder or remove actions. As of September 2007, Pineapple News is completely free. This version is totally free, and will not expire. I still use it myself quite a lot, but active development has ceased. If anybody has a burning desire to take over maintenance of the program, send me an e-mail. You can download version 0.9.0 here.